Just Shy of a Y: Are you ready for some football? I am so excited about the cooler weather and fun fall Sundays filled with NFL football games. But yes it is only July...training camp is a day or two away, and yes Layla is wearing a sweatshirt. She wanted to go outside with it on, It is approximately 101 degrees outside in Texas. Silly girl! And boy...really?!? 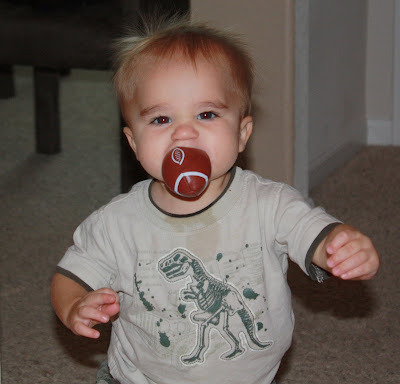 A football in your mouth?!? We love football too!!! My hubby is already talking about football season! We are Bucs fans! We love football at our house too. We'd like to go to a NFL game this year but I don't know if that's going to happen. My husband is a huge Giants fan...can we still be friends? oooohhhh, I can't wait! 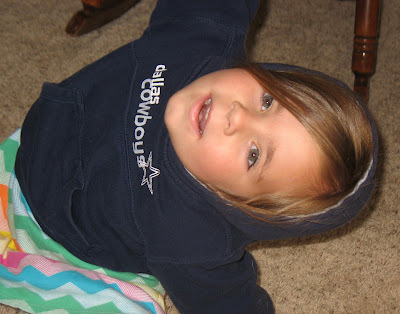 Seeing her sweatshirt makes we want to go out and buy my kids some new Cowboys attire. gotta have it! We have friends over for the games quite a bit, so be expecting an invite this fall! You have a beautiful family!!! My son just started football last night, and I have to say I am a bit nervous! Love to watch him in any sport though!